You will hear plenty of "experts" tell you that you need to be able to be off-grid and be able to completely unplug from the grid if you can at a moments' notice. That can be very expensive also considering most people either need to purchase a new house, build a home, or retrofit their current dwelling. Most of those experts do not exactly admit to the fact that it took them years to become off-grid and the amount of work it takes to be off-grid. Admittingly, I would love to have an off-grid home with solar panels and a wood stove/boiler system. However, again, I don't and I still consider myself a prepper. You will also hear a lot of preppers telling you that you need to be homesteading in addition to preparedness. The reasoning behind this is so that you are not suffering much when the food supply is interrupted and you can be self-sufficient. You need to be growing your own food, raising livestock, and living on an acreage somewhere. This one I am guilty of. I have been homesteading and do so in addition to my preparedness. However, this may not be a possibility for a lot of people who want to prepare. While it is a great addition to my preps, I have no illusions that I can supply all my food needs with what I raise and the eggs my chickens lay. I would need to grow a lot more and get a rooster so I can repopulate my chickens. Having the big ticket prepper items is not what preparedness is all about. 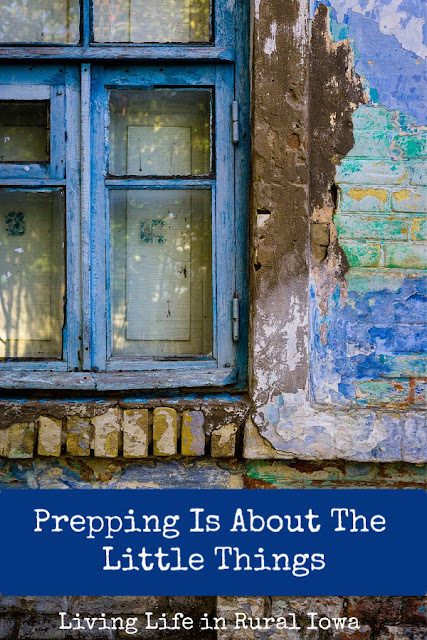 Being off-grid or being a homesteader is not what prepping is about. Being a survivalist who can live in the woods for weeks at a time is not what prepping is about. They are nice things to learn, practice, and live because they are things that will enhance your preparedness. Prepping is about the little things. Prepping is about the skills you learn, the items you need to have in an emergency, the knowledge of what to do in most situations, the daily habits, and the life you live in general. Prepping is about having plenty of food and water on hand to take care of your basic needs. Prepping is about having a shelter, being warm, and having some light to see by. Prepping is about being able to fix and mend most things. Prepping is about being to thrive and survive with what you have and making the most of what you have. The reality for most preppers is that they cannot afford the big things. They cannot afford to move. They can not afford to build or renovate a home. Most of us are still living our normal lives with our regular bills, family expenses, and other daily living expenses. We cannot afford the big things. We can try to save up for them, but we also need that savings for any emergencies that may come up (which is prepping, by the way). Prepping is 100% personal effort. You get to make prepping as big or as little as you want it. You get to explore what interests you and you get to do what is best for you and your family. If you are happy and comfortable with having two weeks worth of supplies on hand to withstand most emergencies, great. You are still way ahead of most people when it comes to crisis time. If you want to go further and prepare for more, you have the right to do. However, prepping is about making sure the basics are covered. We may call it little things, but they are the things that will save your life and keep you out of the FEMA/Red Cross lines. So they aren't so little really. They are more important than having all those big-ticket items that most prepping "experts" will tell you need to have.